Others so packed with meat and beans and peppers and tortilla strips that you could do the perform a Mexican hat dance on the surface. 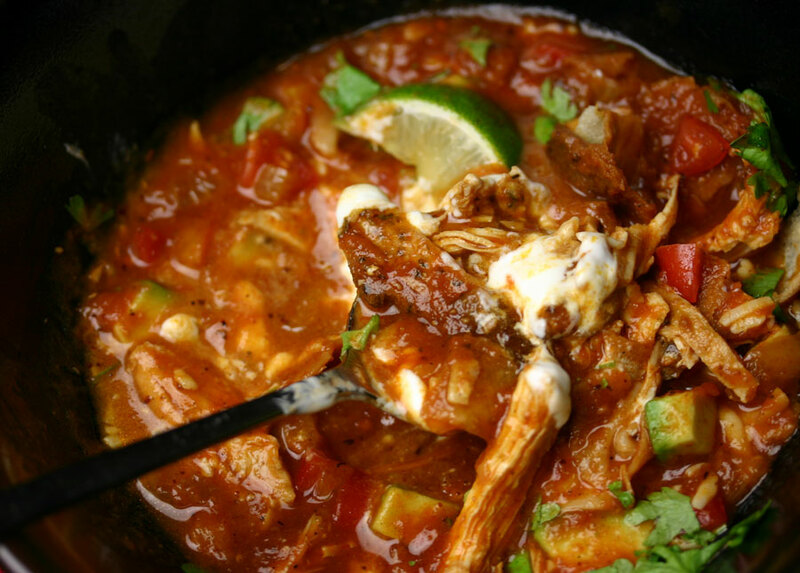 My chicken tortilla soup is on the hearty side, a rich and spicy tomato broth ladled over a mound of whatever each person likes best and topped with a fresh coriander and a dollop of sour cream. Combine the chilli powder, oregano, cumin and garlic powder. Place the chicken breasts in a dish, and sprinkle with half the spice mixture. Add 1 Tb of oil, and toss until the chicken is well coated. Place the chicken on an oiled baking tray and cook for 20-25 minutes, or until cooked through. Set aside to cool, then shred along the grain. Fry, grill or bake the tortillas until golden brown and cut into strips. Heat a heavy saucepan over medium low, and add the second tablespoon of oil. Add the onion and saute until softened. Stir in the remaining spice mixture, then add the chopped pepper and garlic. Cook for a few minutes more. Add the passata and chicken stock and bring to a simmer. Season with salt and pepper, and cook the broth for about twenty minutes, partially covered, until thickened. Adjust the seasonings. When you are ready to serve, place a mound of chicken in four large soup bowls. Top with tortilla strips, tomato, avocado and grated cheese. Ladle the soup over top, and garnish with coriander. Serve with lime wedges, a dollop of sour cream and hot sauce to taste.